Wednesday morning started with a full Scottish breakfast (for Chad) at the hotel. This breakfast included a fried egg, tomato, ham, potato cake, sausage and beans. I probably left something out, but that is all I can remember. Those of you that know me well can understand why I had cereal for breakfast! There was a bus stop just outside of our hotel and it was about $10 for an all day pass for the four of us. This was a great deal considering we paid almost $50 for our taxi ride. It took about 45 minutes to get into the city, but thanks to Tucker we had an early start and got there before 10 am. Since we had no idea where we were going, the information center was our first stop. 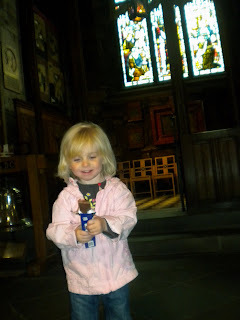 We explored Princes Street and went in several churches and gift shops. The kids were starting to get hungry so we found a pub that allowed children. We had a quick lunch and hit the streets again. While waiting for our food, we had a chance to check out the map and see where we needed to go. It was cool and rainy so I did not want to just blindly explore the city without some direction. We decided that the Royal Mile was the best place to be. Edinburgh Castle was on one end and the Queen's Palace was on the other end with a million shops between the two. Tucker fell asleep in the stroller so this was our prime time to do stuff! We went to another church (can't remember the name...will fill it in later when Chad gets home) and Chad let Caroline pick out a "special treat" in the gift shop. She picked out the biggest chocolate bar she could find! Chad and I just had to help her eat it! We then began to walk up to the castle. We went in the castle and looked around a little and then went to the gift shop. Caroline immediately found a crown and then she tried on the Viking hat. 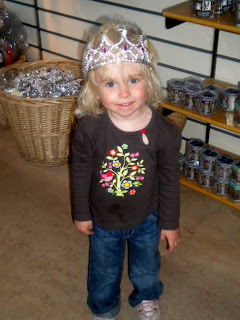 Needless to say, she wanted the princess crown (and got it!). From there we went to a Tartan Museum to see the million different patterns and how they were made. It was really neat to see, as I had no idea there were that many patterns. We picked up a few scarves and blankets, a couple t-shirts for the kids, and the cutest little kilt for Caroline. I just didn't foresee Tucker wearing a kilt, so we did not get him the matching one. Caroline was starting to get tired and Tucker was waking up so we took a break and went into an old church and did some brass rubbings. There were some toys for Tucker to play with while Caroline and Chad did their brass rubbings. The finished products turned out quite well! Now it was time to go to the Queen of England's Palace in Edinburgh. We did not go in because it was almost closing time but we did get some pictures from the gates. We were all getting tired at this point so we figured it was time to go back to our "restaurant house" as Caroline calls it. The ride back to the hotel seemed to take longer than normal this time around. I guess it was because we were hungry and tired and just wanted to get there! We finally made it and dropped our things off in the room and went back downstairs to get a quick dinner and then bed. Tucker only slept for about an hour and Caroline slept for about ten minutes on the bus, so we were certain it would be an early night. Unfortunately, a party of sixteen had just been seated before us and dinner was not going to happen anytime soon. Unless we wanted to get on the bus again, there were no other options. We realized the kids were not going to be able to wait so I took them up to the room and tried to get them ready for bed. I was successful as far as getting jammies on, but past that I had no luck. They were literally bouncing off the walls. I think they figured out a way to drain the energy from Chad and me and take it for themselves. Our dinner was ready and Chad ate downstairs by himself and then we traded. I had hoped that maybe Caroline and Tucker would take Chad seriously and go to bed. They managed to have more energy when I returned after inhaling my dinner. It was about 10:30 by the time they fell asleep. I think Chad was already asleep at that point and I was not far from it. My family and I went to Edinburgh one summer while on vacation in England- it's an awesome place to visit. You guys seem to be having such a great trip, what wonderful memories! !